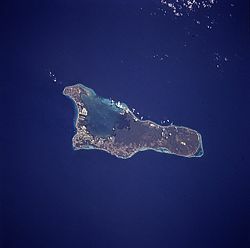 Grand Cayman from space, April 1994. Grand Cayman is the largest of the three Cayman Islands at about 196 km² and contains the capital George Town. Towns on the island are referred to as "districts". It is located at 19°20′N 81°13′W. Grand Cayman on Google Maps.